Anyway, we were working there, and it was awesome. On Friday, June 5th we were working at the registration, which basically meant we had to give people their tickets, and on Saturday and Sunday, we were responsible for the entrance to the main hall, where all the panels were held. So, basically, we were checking people’s tickets, making sure everyone had one, and got to see the panels at the same time. So much for the introduction to this post. It was a convention that worked like any other convention, so there were panels and a couple of workshops and stands where you could buy stuff. And you could buy photo ops and autographs and meet & greets as well. They had 5 guest stars attending: Mark Pellegrino (Lucifer), Kim Rhodes (Sheriff Jody Mills), Osric Chau (Kevin Tran), Travis Aaron Wade (Cole Trenton) and Misha Collins (Castiel). Misha had to leave on Saturday evening, so he did extra autograph sessions and an extra party on Friday evening, which was sweet. They were all just so sweet! We saw Misha and Travis at Asylum 14 in May, so we already knew how nice they were, but it’s still amazing. And the rest of them are amazing too. Everyone was amazing. The end. Or not. Okay, so they all had panels, of course, starting with Kim, then Osric and then Travis. After that, Travis had a raffle where people could win different things, like photo ops, autographs, some amazing fanart, and a slow dance with Travis. When that was done, Mark had a panel, and then Misha. Mark got people to come on stage to ask their questions, and everyone got a hug; Misha walked around in the room – you forget how tall the guy is until you see him up close. And guys, his eyes! Just sayin’. The Saturday ended with an autograph session, and then a Karaoke Party in the evening, which was really awesome, because Mark, Osric and Travis all sang, and Kim mouthed the songs. The fan who won the dance with Travis got that then as well, and that was very adorable. The man is incredibly cute. Mark and Osric can both sing so well! And have you ever heard Osric rap? Because let me tell you, he can. Is there nothing he can’t do? Idjit. On Sunday, there was a talk about Heaven & Earth and the creatures on Supernatural, followed by another Travis panel, then Osric & Kim, then Mark. After that, there was a costume contest, with a lot of amazing costumes – I loved every single cosplay, and I seriously admire everyone who has the time, courage and talent to cosplay. (Charlie won, by the way, followed by Crowley, his hellhound & Rowena, with a Leviathan getting third place.) They had an auction after that, with Parvis, Kim and Mark auctioning all kinds of things, like the banners they had hanging around, banners of the guests – Mark and Kim signed theirs, and Kim promised she’d kiss and hug the person who bought the one of her, and she did, and Mark followed her lead after – T-Shirts, props, signed scripts… Half of the profit went to Random Acts (that’s Misha’s charity). And let me just tell you that Kim and Mark are fantastic at auctioning stuff. Everything went away for an incredible amount of money (the biggest amount being 300€, I think, which someone paid for the script, signed by everyone who was there, and Misha even made his kids sign it). 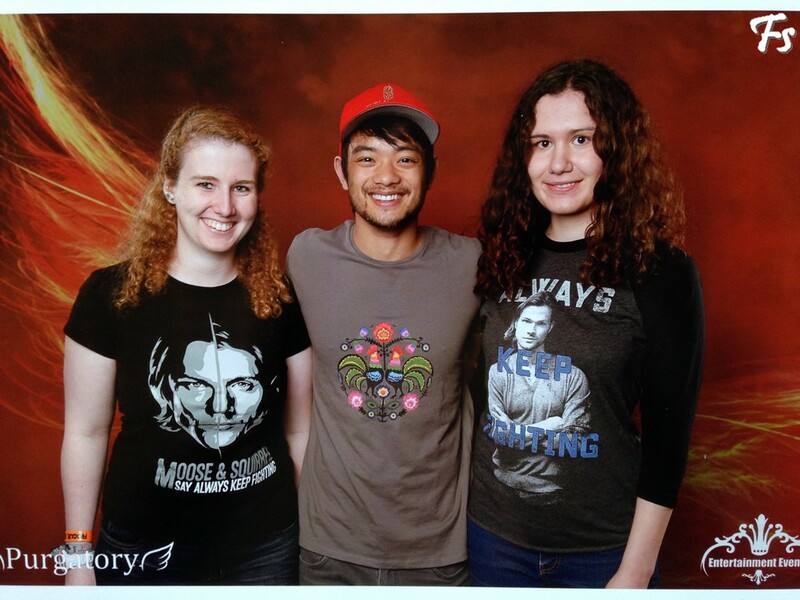 We had a photo op with Osric and one with Travis, so two more con pictures to hang up on our wall! So cool. And we finally thought of something fun to do for the next photos so it’s not just us awkwardly standing there, so hopefully the next one will be more personalized! And it was a really strange feeling when it was over. We took a picture with the rest of the staff and then were on our merry way, and it was so awesome that we’ll definitely try and be part of the staff again next time! 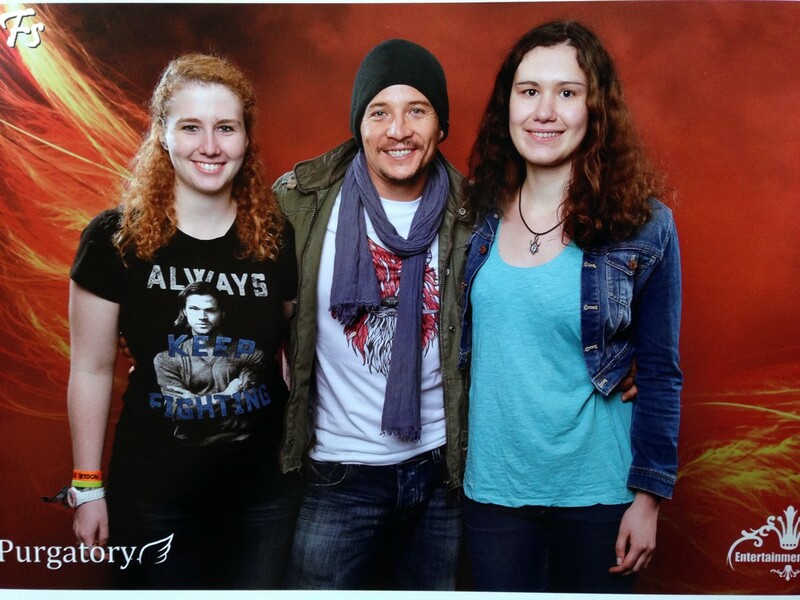 Because Purgatory Con was awesome. Really, really awesome. 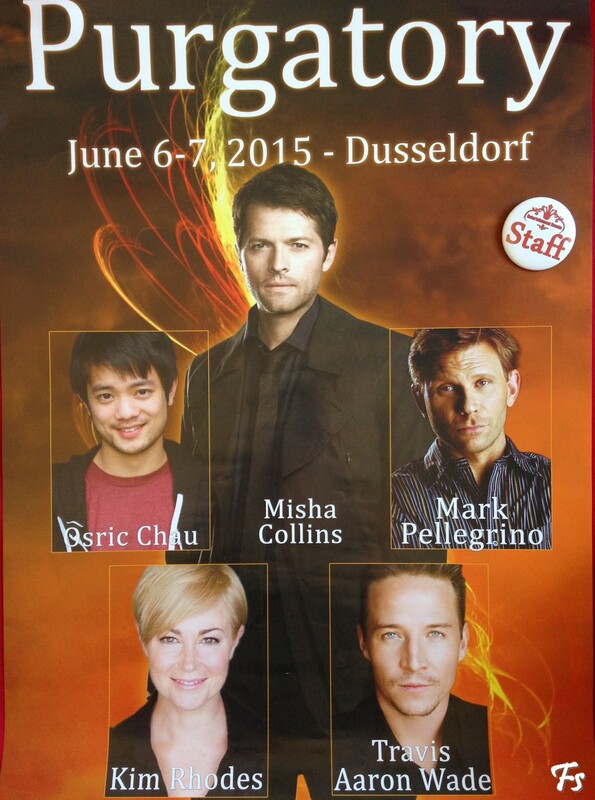 Should you find yourself in Germany in May next year, check it out! It’s so, so worth it, it really is. Sounds fantastic! Staffing a con must give you such a different experience than just attending.